The greatest heroes in the universe must assemble all of their might and power to defeat the evil and powerful Thanos. Play MARVEL Strike Force on PC and Mac to take on the great Thanos and save the planet Earth once and for all. Great superheroes and supervillains await you in MARVEL Strike Force. Earth has become the next target of the planet-destroying Thanos and once his assault on Earth starts, it will take a powerful superhero team to stop him. Play MARVEL Strike Force on your computer to jump right into the pages of your favorite graphic novels and assemble the greatest team of superheroes featuring Iron Man, Spider-Man, Captain America, and more. Strengthen your heroes and use battle strategy to take on Thanos and save the world from a brand-new threat. Neden Bluestacks'te MARVEL Strike Force oynamalıyım? BlueStacks 4'de yer alan MARVEL Strike Force "powerups"ları hakkında bilgi edinin. MARVEL Strike Force oynayın. BlueStacks Puan kazanın. Ödülleri toplayın! MARVEL Strike Force Keymapping özelliği ile en etkili şekilde BlueStacks oyun platformunda oynanır. PC'de MARVEL Strike Force nasıl oynanır? 3 MARVEL Strike Force Sağ üst köşedeki arama çubuğunda MARVEL Strike Force için arama yapın. 5 Yükleme tamamlandığında Uygulamalarım sekmesindeki MARVEL Strike Force simgesini tıklayın. 6 İşlem tamam! PC'nizde MARVEL Strike Force oynamanın keyfini çıkarın. While MARVEL Strike Force features a number of great and powerful heroes, the most powerful of them all is right on your computer. The free BlueStacks 4 app for PC and Mac gives you the chance to play any Android game right on your computer without worrying about cables and other hassles. BlueStacks allows your computer to download, install, and run any Android app directly from its hard drive, eliminating the need for wires or mobile devices. Play fast with the BlueStacks 4 gaming engine and never lose your connection min-battle again with your reliable home internet service. In the end, this may the difference between life and death for the people of Earth. The time has come to show the world what they have to fear. Stream MARVEL Strike Force for free when you use the BlueStacks 4 player to fight larger and give the people of Earth something to cheer about. Share your heroic exploits with fans and friends while offering them something to share with others as your fame grows among the people. The new and improved BlueStacks 4 player allows you to instantly stream all of your video game action with the ease of one-click controls. 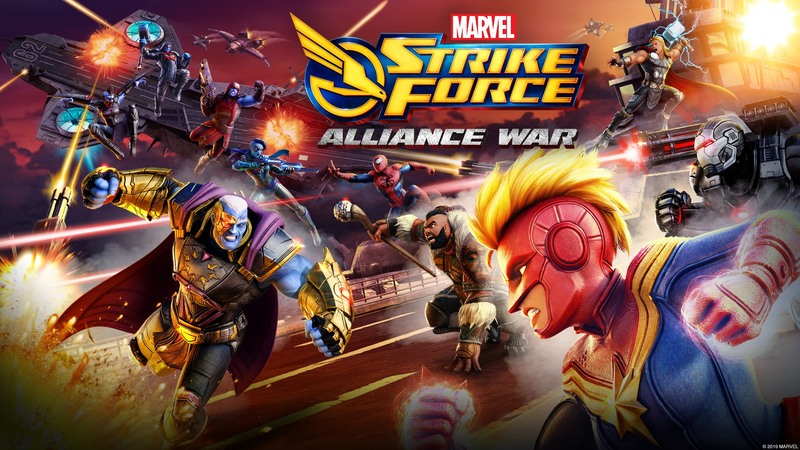 Get into the battle and watch your followers blow up by streaming MARVEL Strike Force for free with the BlueStacks 4 app.